This is a free version All-Nighter EA. The free version opens only buy trades on certain days of the week (Monday, Tuesday, Wednesday). It is highly recommended to perform testing on tick data with 99.9% quality. In case of significant volatility during the day, especially with a strong one-way movement, it is better to monitor the trading of the EA, or to stop the trading at night. If you use multiple instances of the EA on different charts with different strategies simultaneously, it is necessary to reduce the risk on each of them by the number of instances used. For example, if you plan to risk 10% per trade and run 4 instances of the EA, then each of them should have a risk of 2.5%. Small profits but its a free EA so its good! Great EA 2 weeks no loss yet! Great seller also! :) "Very happy!!! Excellent job! This EA certainly has a great potential. Wonderful EA, very well built in its smallest details, very stable and virtually no losses. 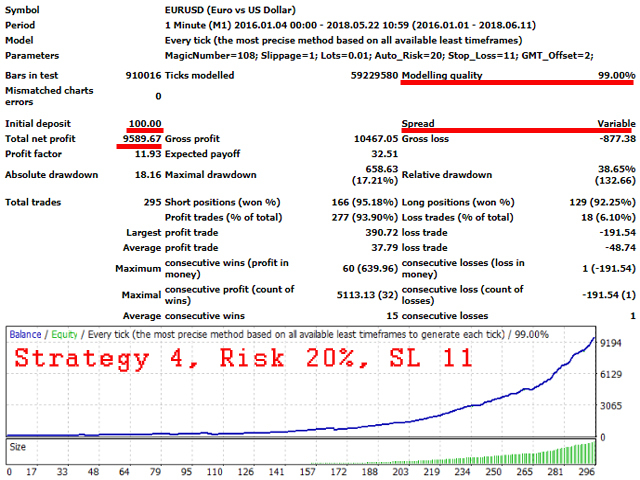 I use this free version in an Icmarkets account with 130 Dollars and the results are incredible. I tried the EA test. It's a very good EA of performance. I use it in the real account if the 1 year good profit. I will buy a full body. Backtest and signal provided by the Author is really fantastic. But this free version has limited capabilities. I had it put on real account yesterday. one trade was made both on my account and author's. It was a loss for me and his account made profit. Ofcourse he was using the full paid version of the EA. profitable and very safe EA.